E-bikes are quite popular, becoming more so in a world that needs to find another way of getting around. It is no secret that roads are getting more congested and air more polluted, freeing up space on roads for those in trades and drive as part of their profession benefits everyone. Here at MI we get requests to repack many different types of battery packs and not a week goes by that we don’t get a request to repack an e-bike pack. Fitting quality Li-Ion cells into peculiar shaped e-bike battery enclosures can often be a challenge, many are originally fitted with Lithium Polymer type cells of custom shapes and sizes. We simply cannot stock all capacities and shapes in polymer. So we do our best and dive into the challenge fitting excellent quality Panasonic cells. Sometimes we simply cannot replace the cells in a pack; this could be because we cannot arrange the cells we use in a way that will maximise the capacity in the enclosure. Other times we find that the protection circuits required to keep Li-Ion cells in their safe operating parameters is faulty, inadequate, or not even installed! In cases like this we have to inform the customer that unfortunately we cannot help them. But what if we could offer an e-bike battery that has quality cells and a battery management system that will keep the cells inside safe and enjoy a long service life. That’s what we have with the Mondia range of batteries; both 24V and 36V batteries are now available. All batteries use Panasonic cells which we choose to use for most of our repacks of batteries in all industries and design into our OEM packs. The battery protection circuit used in these deserves a special mention. The chipset used for battery protection is from Texas Instruments, the undisputed leaders in battery protection devices and battery capacity measurement. Most e-bike batteries on the market use voltage level measurement for indicating the state of charge of a battery, this is an inaccurate method for measuring the remaining charge in a battery. Depending upon how much load is on a battery, the voltage will dip and rise causing any readings to be false, very rough at best. The Mondia battery uses a method called coulomb counting, essentially, it reads the power going into and out of a battery and adds it up over time. Simply put, this means there is no charge level reading that moves up and down depending upon voltage levels while riding. All readings are of actual charge in the battery; this allows the LEDs on the battery and the optional digital display to accurately show the percentage remaining in the battery. E-bikes come with various mounting methods for batteries, this creates a problem when offering an e-bike battery replacement solution. 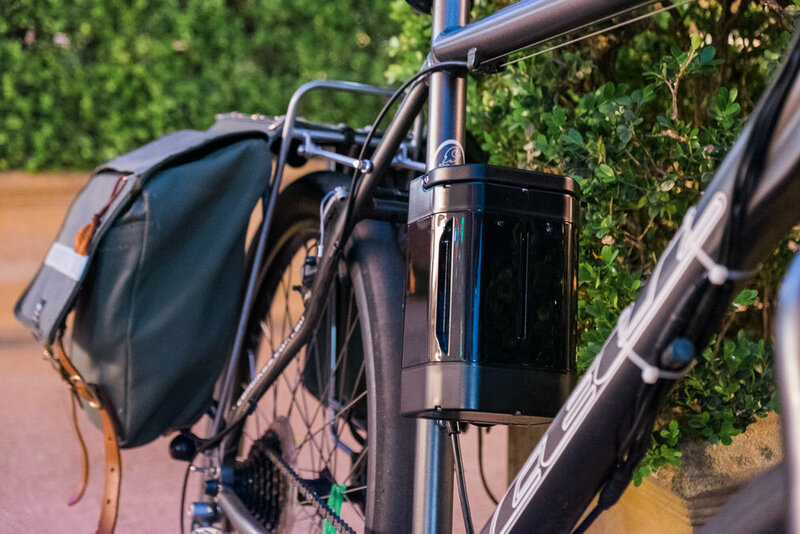 To cover this issue Mondia have designed two mounting kits that allow you retrofit the new battery to an existing e-bike. There is one for mounting to a flat plate, another for mounting the battery to a seat tube. The mounting options also opens up the field of modifying a standard bike to an e-bike using one of the several kits available on the market. The Mondia battery can be fitted to practically any bike, and because we take our testing seriously at MI, we modified a stock standard Cell X-1 into an e-bike using the Bafang 250W mid drive kit and the Mondia 36V 9.0Ah e-bike kit. The modification from bike to e-bike was done in one lazy afternoon, so quick I forgot to take photos of the transformation. The battery mounting did not require any bike specific tools, retrofitting an e-bike to use the Mondia battery is an easy task. The Mondia 24V and 36V e-bike battery and mounting kit, a highly recommended way of getting your e-bike fitted with a top quality battery that will have you back on your bike in no time.